Taken with Olympus E500 digital camera October 19th 2008. Click image for larger view. Autumn brings us some fantastic colors to photograph. Here is a picture from a walk I had in the forest yesterday. Some places the forest the ground was completely covered with yellow leaves. It was so beautiful and of course I had to take some pictures. I like how the sun shines through the treetops and the wooden stairs to the left, add more interestingness to the picture. The wooden stairs have been built on this wood track to help people at the steepest parts in the forest. Feel free to click on the picture to view it in large size to see more details. 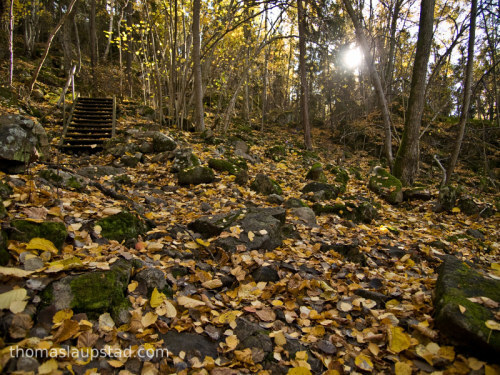 Check out this photo from last year of a stream covered with autumn colored leaves. Nice attempt… I’d like to have more of the trees and sky, along with a bit of the steps. My suggestions would be to go a bit closer, and angle the camera up a bit. Right now, the splendour of the place is being chopped off at the top. The image feels too restricted. Thanks for the suggestions Susheel, but I do not agree. The trees and sky were not important for me in this pic. I mainly wanted to show all the leaves. I love shots of sun through trees. This one is very nice. Leaves are nice too! What a lovely shot! The sun shining through the trees does definitely add to the picture. Nice work, Thomas. The sun through the trees adds a great touch to the scene. nice attempt.one of the malayalam bloggers had copied it to his blog. I do agree with you and you have capture the golden beauty off fall in Norway very well. Oh my I am so glad that you dropped your card on me. I think all of your work is simply incredible. I am a novice just learning currently only working with a standard digital. But I hope to change that very soon. I have enjoyed viewing all of your work so very very much. Autumn kinda makes me feel lonely. Great pics. keep up the good work! Ð”Ð¾Ð±Ð°Ð²Ð¸Ð»Ð° Ð² Ð·Ð°ÐºÐ»Ð°Ð´ÐºÐ¸. Ð¢ÐµÐ¿ÐµÑ€ÑŒ Ð±ÑƒÐ´Ñƒ Ð¿Ð¾Ñ‡Ð°Ñ‰Ðµ Ñ‡Ð¸Ñ‚Ð°Ñ‚ÑŒ!